London-based practice Yellow Cloud Studio has designed a triangular-planned glass and plywood extension for a Victorian house in Hackney that makes a virtue of its awkward space. 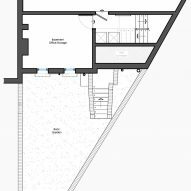 The existing layout included a north-facing, triangular garden that was slightly higher than the lower-ground floor and accessed via a bulky external staircase from the ground floor. Practice co-founder Eleni Soussoni said this proved to be the studio's biggest challenge, as well as a crucial element for the design process. The external staircase was demolished and the practice dug down so the 25-square-metre extension is level with the lower-ground floor. It takes up the majority of the existing garden space, however, the design and use of materials creates the perception that the space is semi outdoors. Instead of squeezing the extension up against the back of the original house to maximise the garden, an open-sided timber structure sits proudly across the centre of the space, appearing almost freestanding. It is attached to the house by a thick strip of glazing, which floods the structure and rear rooms of the house with natural light. 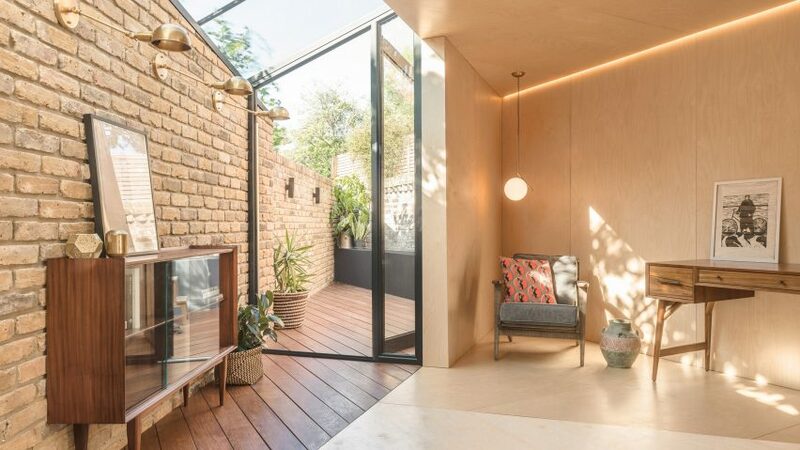 The extension continues with a wedge-shaped glass skylight and glass door that opens onto a small patio with built-in seating. "The project's choice of materials is very particular and every decision was made based on the form and concept of the design," explained Soussoni. "The complexity of the structure had to be balanced with a minimalism of materiality – plywood, timber deck and glass." Every surface of the Triangle, as it became known, is clad in a high-quality birch plywood. These surfaces needed to be meticulously cut to maintain even gaps and continuity to the connection lines. In the areas beneath the glass skylights, the walls are made of exposed, yellow stock bricks in reference to the Victorian character of the original house. The flooring in these areas is a dark-stained decking that continues out onto the patio area, reinforcing the interplay of interior and exterior areas. "The triangle is treated as a clean, separate volume, not having its materiality repeating in any other part of the project," said Soussoni. "Walking into the study and looking at the floor, the clear separation lines intensifies the experience of the shape and its space," she added. Reinforcing this feeling of separation, the back wall of the old house is distinct in appearance, with white brickwork, black window openings, and a lighting fixture that is reminiscent of an outdoor carriage lamp. 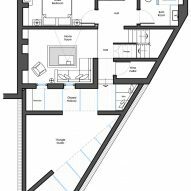 Separately, Yellow Cloud Studio converted the basement of the property with a bedroom, bathroom, utility and movie room, and designed an ensuite bathroom on the top floor. In the ensuite bathroom, it rethought the space with the original chimney stack providing the line for symmetrical his-and-hers basin areas. In both bathrooms, pastel colours are combined with a warm-toned grey polished plaster wall finish, patterned tiles and concrete basins to create an atmosphere of calmness. Photography by Alex Forsey Photography.